Ever wonder where Batman gets his well-crafted gadgets that leads to adventures? Now you don't have to! Pick up a Gravity Hook in Stainless Steel and you are ready to save the day! 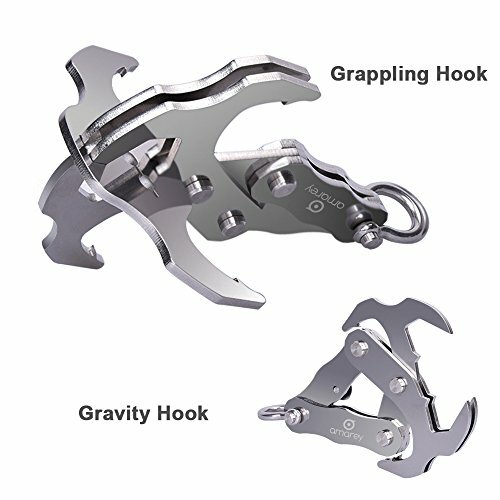 The multifunctional grappling hook is a cross between a mechanical claw and a grappling hook. When it touches down, the gravity pushes the jaws open. And the jaws are pushed closed naturally when reversed. Tie any rope or string to the "shackle" at the bottom and drop your Gravity Hook to pick up anything you'd like! Whether it be pulling up mechanical parts or for emergency use, the mechanical claw and grappling hook is firm enough for various situations. - Can be adjusted to be used as a 2 pronged hook. - Grips objects that might easily slip out of a conventional grapnel. - Installing a Cross Hook makes it a 4 pronged grappling hook. - Compact enough to bestowed onto a backpack strap. - Can be dismantled for easy, compact storage. This high quality and durable folding grappling hook can be used in outdoor activities, wilderness survival and adventurous activities. It is one of the essential equipment for outdoor enthusiasts. Please make sure the rope used in conjunction to the hook is solid and stable enough for use. The hook claw reaches the highest level of gripping power by using oil quenching process to provide extremely durable operating reliability. The folding grappling hook has NOT been tested or certified to bare human weight. NEVER use in circumstances where failure or dislodging might cause bodily harm or property damage. PATENTED DESIGN STEEL LATCH PIN - We provided steel latch pin to keep the Gravity Hook closed firmly. Additional hole is for the steel latch pin storage in the grapping hook, to keep the steel latch pin in place. No need to worry about losing the rubber bands!